tree along Flamingo Road in Davie, authorities said. said the Tesla was traveling at a high rate of speed before the crash. the crash. Police advised drivers to use alternate routes. tried to remove the battery from the burned-out remains of the vehicle. can cause fires in both gas and electric vehicles. Rd. The #PIO is enroute. 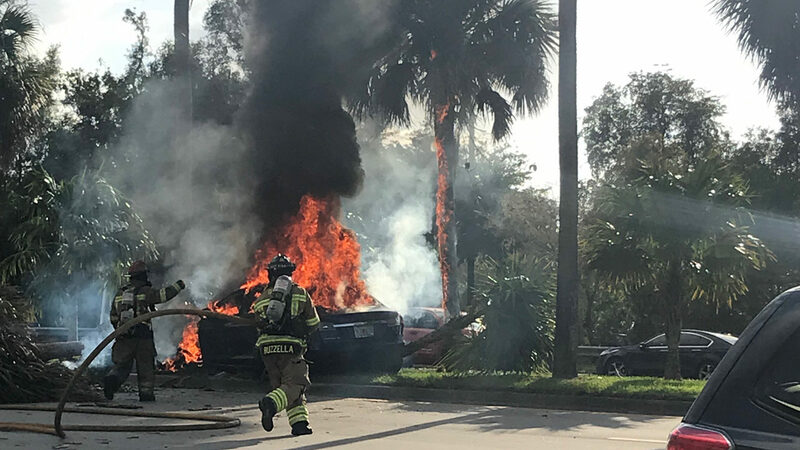 electric vehicle hit a tree and subsequently burst into flames in Davie. 1200 block of South Flamingo Road around 4:30 p.m., Sunday. Officials said when they arrived, they found one victim dead on scene. Officials are advising drivers to avoid the area.